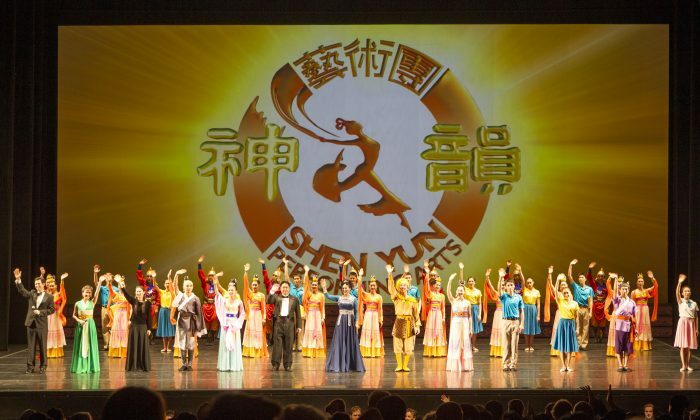 MELBOURNE, Australia—Shen Yun Performing Arts International Company held a matinee performance at the Melbourne State Theatre Arts Centre on March 29. Among the audience enjoying the performance were Shriram Iyer, professional multi-lingual singer, signed with Warner, and his wife Dr. Iyer. Mr. Iyer has performed in over 2,000 shows in India and across the world, including the 2010 Commonwealth Games. He was enthralled with the Shen Yun performance. He was captivated by the resounding voices of bel canto soloists sopranos Rachael Yuning Bastick and Min Jiang, and tenor Zhen Bei were an integral part of the Shen Yun experience. The animated digital backdrop and brilliantly colored costumes were very appealing to Mrs. Iyer. “Beautiful, really beautiful,” she said. “It was very well coordinated. Everyone was very colorful and it was visually attractive, very rich,” Mr. Iyer said. The divine theme that ran through the Shen Yun production was familiar to Mr. Iyer. Mr. Iyer acknowledged the connection between his own culture and that of ancient China as portrayed by Shen Yun. The impact of Shen Yun on society in these troubled times was good, he said. “I think the message, as I said, is universal. If you talk about love, compassion, brotherhood, I think everyone understands that language, regardless of where they come from. I think it is very universal,” Mr. Iyer said. Being a professional artist himself, Mr. Iyer admired the performers’ ethics. So would the couple recommend the Shen Yun performance to their friends? “We will. We will be putting it on Facebook and we will tell them. My band is called Saffron Groove, we have a lot of fans and so we will tell them,” Mr. Iyer said.